By Valentina Dinica, Victoria University of Wellington. New Zealand is one of 36 global hotspots for biodiversity. Its unique wildlife is a major draw card for tourists. About three million international visitors arrive in New Zealand each year, adding NZ$15 billion to the economy. At least half explore a national park or protected area (PA), but they contribute very little to these conservation lands. Government policies implemented since 2009 as part of a “conservation economy” vision aimed to stimulate economic growth by opening up business access to national parks. Contracts have been granted with an expectation that businesses that benefit from New Zealand’s natural capital would bring environmental and infrastructural gains. My research finds no evidence of such improvements. Here I propose how businesses could help to make nature tourism more sustainable. Globally, biodiversity is in crisis. Experts agree that the world is undergoing its sixth mass extinction. In New Zealand, a third of the land area is protected. Many animals and plants are found nowhere else, but 80% of the country’s native bird species are in trouble. Biodiversity conservation in PAs is funded primarily from the state budget. Historically, the appropriations for the Department of Conservation (DOC) have been too small to tackle the challenge of protecting some 2800 species considered to be endangered, at risk of extinction or vulnerable. The contribution of tourism to DOC’s budgets has so far been below 9%. This includes concession fees from tourism operators approved to access PAs, user fees for huts and other facilities, donations and sponsorships. Funding cuts are reported around the world, particularly under neoliberal or conservative governments. Stagnant or diminishing budgets sometimes occur despite growing visitor numbers and ambitious tourism growth targets. The previous New Zealand government aimed to lift the contributions from natural resources to 40% of GDP by 2025. DOC has been asked to prioritise spending on tourism-related operations over biodiversity spending such as pest control and species recovery programmes. This is inconsistent with the agency’s legislative mandate. New Zealand law does not allow charging entry fees for PAs. Attempts to change that have been met with opposition from recreation groups and some tourism businesses. Tax instruments are generally opposed by the tourism industry. Concessions and planning are powerful tools for an ecologically sustainable use of PAs. Several regulatory approaches could help reverse biodiversity decline, while enhancing the environmental performance of tourism. Concession contracts could include responsibilities that reflect the latest developments in conservation practice. Such contracts would need to be followed by adequate monitoring and enforcement. This has been used for some time in several countries, including Australia, Canada, Chile, Rwanda, South Africa and the United States. In these countries, concession contracts are also regularly revised to ensure businesses keep apace with environmental innovation, new ecological threats and changing pressures from visitors. Concession applicants could be selected for their environmental track record and the most deserving environmental design of tourism services. Options here are tenders or auctions, which are already used in the countries mentioned above. Other methods should be used in parallel to ensure that small businesses are not disadvantaged. In the United States, the legal framework for concessions has been revised in 2010 to ensure this doesn’t happen. The planning of tourism development needs to be sufficiently specific to the ecosystems in each zone. Under a concession plan, authorities determine the ideal location of particular tourism activities and maximum numbers of tourists and tourism operators. Recently, authorities have restricted the number of tourism operators allowed to operate in the Haleakala National Park in Hawai’i to only four, based on a concession management plan aiming to ensure environmentally and culturally acceptable tourism. Such planning is already practised in many countries, including Australia (Queensland, Western Australia), Canada, Rwanda and Argentina. Currently, New Zealand is not using best practice in regulation and planning. Concession contracts are designed on a “do no harm” approach. The culture has been that if concessionaires rectify and mitigate environmental effects, then all should be fine. The 1987 Conservation Act enables DOC to insert environmental responsibilities and requirements. However, the analysis of 30 concession contracts and tens of official documents reveals that compliance with more generic environmental regulations is typically deemed sufficient. In addition, DOC’s performance on monitoring and enforcing concessions has raised many complaints, even from tourism operators. 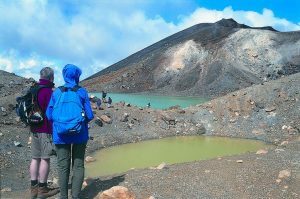 The Tongariro Crossing, one of New Zealand’s most popular walks in a national park. AAP, CC BY-ND. Even more problematic is that DOC mostly uses the non-competitive “first-come first-served” method to allocate concessions in PA plans that do not use visitation quotas, except for a few tracks and sensitive sites, such as caves or wetlands. The cumulative impact of approved concessions has led to a number of tourism hotspots in several national parks. For example, helicopter landings have increased dramatically in the Fiordland and Westland National Parks. The famous Tongariro Crossing track is now used by thousands of visitors on any day with reasonable weather. However, DOC views this as a social carrying capacity issue. The government needs to demonstrate concern by implementing innovative regulatory and planning instruments with proven effectiveness. If a government cannot ask businesses that profit from access to a country’s most precious lands to use the best available environmental practices to manage biodiversity, then who can it ask? Feature image: Helicopter in Milford Sound, Fiordland. Credit: Wikimedia / Oren Rozen.